Our Planning depends on the number of orders we receive from our customers and from the significant experience we have gained throughout the years. Planning ahead is essential as our main principle is the duty of care to our Customers. The Company's management team organizes an initial meeting with the farmers in late August in order to discuss and prepare the initial planning of the year. The farmers state their expectations for the forthcoming year and discuss with our management team about the amount of seed they'll probably need to be provided, as well as other general issues relevant to the growing of potatoes. Our Sales department is in daily contact with our farmers, keeping up to date with our planning process. We import the best quality of potato seed which is allocated to our farmers who, in turn, arrange for the plantation of the seed. Quality Controls are vital as we believe that the implementation of controls sustains the high quality of our products throughout the whole year. 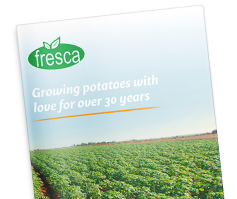 During the year we monitor the processing of the potatoes and the Company's own agronomist is responsible of making sure that the quality controls are put in place and are maintained throughout the whole process. Once the potatoes are ready for harvesting, our farmers inform the Company's agronomist to progress the final approval for the potatoes to be lifted from the ground. The farmers deliver the potatoes to the Packing Premises and then the Company provides the services of grading, sorting, packing, and exporting to the clients. There is an adequate number of staff who is engaged in the grading, sorting and packing of the potatoes in order to achieve the Company's objective to provide a top quality end product to each and every one of its clients. We guarantee Safe and Fast delivery for your products! The logistics department takes over the next and final step which is to organise the orders of each client and arrange for the transportation of the potatoes from the Packing Premises to the port in order to transfer the potatoes to our clients as soon as possible.